I just got back from a little 13 inning game at the ballpark formerly known as SkyDome. I took the kids who were enthusiastic angels for all 13 innings and it couldn't have been a more exciting game. It should have been a quick 3-0 shut-out and a well deserved win for Shaun Marcum. With B.J. Ryan on in the ninth to close it out, the Tampa Bay Rays managed to tie it at 3, in part thanks to an infuriating error at second base by one Joe Inglett. Instead of a tidy 2.25 hour game we got a 4+ hour marathon that ended in 13 on a 2-out walk-off grand slam by Gregg Zaun. This is the first walk-off grand slam I've ever witnessed live and it gave us a 7-4 win. That's right, if Zaun gets out, we lose this sucker. Hot damn, that was fun. The kids and I were literally jumping for joy as Zauny got mobbed at home plate. It's our seventh win in a row, our highest total in four years. Not even my presence was enough to break this streak. A big thanks to Stephanie, a regular reader, who sent me the tickets. They were great seats, in the first row of the 200 level right by 3rd base. It was an even better game. The photoset is here. I've dug up an interesting stat. This was the second walk-off slam in franchise history. George Bell did it in 1986. This was the first walk-off slam in franchise history to take place in extra innings. We took the kids today as well and it was one of the most exciting games I have ever seen. As the bottom of the 13th inning was beginning our crew was asking our boys to tie it up (jokingly) and then Greg Zaun gave us an amazing home run while the bases were loaded. I must say Tampa Bay #53 frustrated the hell out of me. He pitches weird. Otherwise Beautiful game!!!! Wikipedia tells me he is a submarine/sidearm pitchers. I was jumping up and down in my living room!! I had tears in my eyes. So wicked! Man I hope we make wild card, for that game alone! Magic!! Nice Mike, They are certainly putting on a late season show if nothing else. 7 and counting, too bad the yankees won last night, hopefully the Yanks can lose today and Jays can sweep. Jill, when the Rays brought on submarine guy, I told the kids all about Mark Eichhorn. Were you also cursing out B.J. for taking Marcum's gem and promptly hitting a guy and serving up a monster homer? I think I missed that part. I was on a scavenger hunt looking for bobble heads with the kids. Your kids must get quite the tutorial watching the games with you. I can't wait for tonights game. Hey Jill, did you see my daughter and I on the Jumbotron? She was being all cute on my lap and they gave us some face time. because I subscribe to them and have gone to a few games this season, so I will not complain. For the people who don't know baseball beyond basic rules and how to play... what is a Walk-off grand slam? 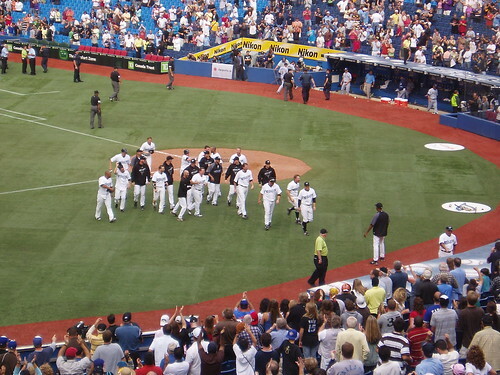 We call it a walk-off hit because after the hit the team walks off the field because the game is over. So, if your hit wins the game in the bottom of the 9th or in extra innings, you have a walk-off hit. Here's a little slice of personal walk-off trivia for ya. Last year, about this time, I had a walk-off hit in the finals of my slo-pitch division. I wrote about that game at http://www.torontomike.com/2007/09/champions_1.html .